Favorite Fictional Character, a weekly event created by my friend Ryan at Wordsmithonia. Frankly, I do not know anyone that doesn't find the National Lampoon Vacation movies hilarious...especially Christmas Vacation. 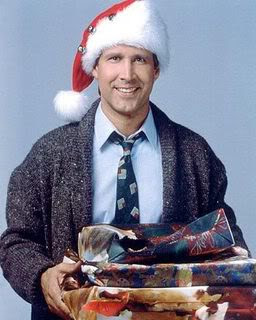 Clark Griswold is the epitome of the funny family man who wants all the traditions for his family and goes above and beyond to get them--with side-splitting results. I have a special reason for loving Clark Griswold. He reminds me of my dad! Yes, we had some pretty funny moments on vacations and just at home and around the holidays. I won't go into details, but suffice it to say that my dad took family traditions and family participation very seriously...just like Clark Griswold! "Where do you think you're going? Nobody's leaving. Nobody's walking out on this fun, old-fashioned family Christmas. No, no. We're all in this together. This is a full-blown, four-alarm holiday emergency here. We're gonna press on, and we're gonna have the hap, hap, happiest Christmas since Bing Crosby tap-danced with Danny f***ing Kaye. And when Santa squeezes his fat white *ss down that chimney tonight, he's gonna find the jolliest bunch of ***holes this side of the nuthouse." "We're kicking off our fun old-fashioned family Christmas by heading out into the country in the old front-wheel drive sleigh to embrace the frosty majesty of the winter landscape and select that most important of Christmas symbols." "They Invented them (Christmas tree lots) Russ, because people forgot how to have a fun old-fashioned family Christmas & spend money on dead over-priced trees that have no special meaning." "I didn't go berzerk. I simply solved a problem. We needed a coffin... I mean a tree. There are no lots open on Christmas eve. Lewis burned down my tree. So, I replaced it as best I could. Viola!" "Hallelujah! Holy s***! Where's the Tylenol?" "Can't see the lines, can you Russ?" I LOVE this movie and my Christmas is not complete without it and A Christmas Story. Boy can I ever identify with the Griswalds and their crazy family! Don't we all have a cousin Eddie hanging out in our family tree, somewhere? Please tell me I'm not the only one! Thanks for bringing up a great movie. Happy holidays! LOL! Great pick! I love the whole movie. I always felt a little bad for Clark as he just wanted an old fashion type Christmas. But, then I start laughing and can't stop. Fantastic choice this week.......This is one of those movies that I can like in small quantities, once every two years is good for me. Anything more gives me a toothache. This movie captures the nostalgia of our childhood Christmas, preserve tradition, at all costs, even if it takes all of the fun out! Well, we can laugh about it now! Gotta love dad!